The V58JD looks like a house cat, but it's really a complex tiger, a bit like Jerry. Either way, it's a wrench to put down, which is how it should be. Highly playable. Impressive components and build. 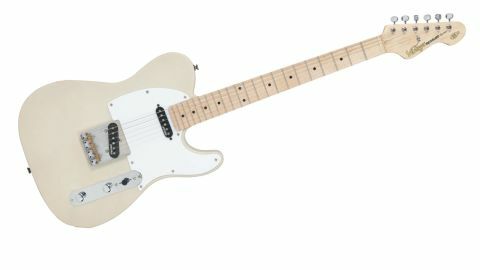 Great for country twang and T-style quack tones. We're not convinced by the 'Woman' tone claims. Famous first for his work with woolly folk-rockers Fairport Convention, Jerry Donahue is now a feisty member of The Hellecasters. Breezily described by the Vintage website as 'the doyen of the string-benders', we can imagine Jerry leading the string-benders into war with his signature guitar, the V58JD. "The V58JD is built for boogie-woogie blues, and bend-laden country chicken-pickin', but there's a smorgasbord of tones available"
Ash Blonde with classic 60s 'Woman' tone - the guitar, that is, not Jerry - it's a simple weapon for a man of simple yet refined tastes. We love the no-nonsense construction; a satin-smooth and comfortably clubby one-piece maple neck is bolted to an American alder body, with a hardtail ashtray bridge making for a stable, solid guitar that rewards aggressive picking and more gentle fingerpicking alike. Sure, the V58JD is built for boogie-woogie blues, and bend-laden country chicken-pickin', but with a five-way pickup selector, there's a smorgasbord of tones available, from overdriven blues to snappy cleans. We can't entirely endorse the V58JD's claims to 'Woman' tone, though - the neck pickup and custom capacitor combo, residing at position four on the five-way switch, sounds warm, woody, and bright, so not like 'Woman' tone to our ears. We can, however, definitely endorse the Vintage marketing department's promises of 'quack-tone' and 'country twang' - there's a pleasing elasticity to the V58JD's voice. Just don't be fooled into thinking that this is a guitar that might sound too tame; drive your amp hard and it will show more than a little attitude.